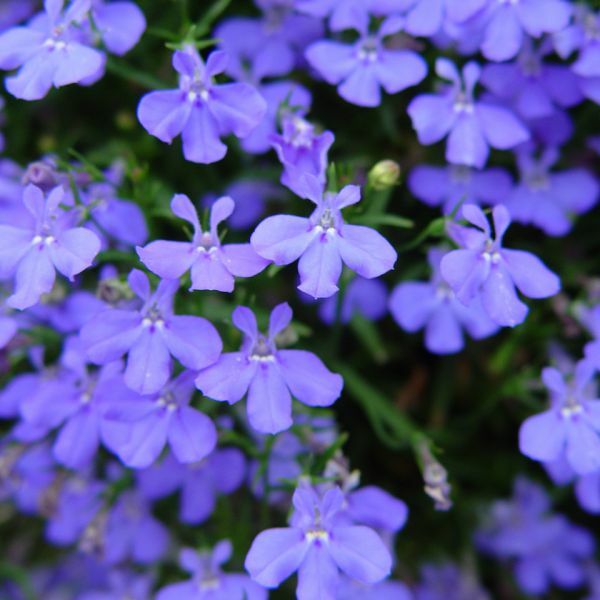 Originally from South Africa, Lobelia are beautiful mounding plants which load up with unique blooms from late spring until frost. The upright varieties are most popular as edge plants in landscapes and are used in 1801s. Our trailing varieties are better used in hanging baskets or as cascading elements in mixed combos. Our vegetative cultivars have been bred and hand-chosen to have a wider color range and larger blooms, and they perform better in the heat than seed varieties. For best results with Lobelia, we recommend using a well-drained soil with a balanced fertilizer and a constant feed program of 100-150 ppm N with an EC between .90-1.2. Maintain a pH between 5.8 - 6.0. We recommend that you first pinch Trailing Midnight Blue 5-10 days after transplanting to your final container. Pinch early and soft to promote good basal branching. Lobelia should be spaced adequately to allow airflow and light penetration between the foliage. Usually 2’ centers on baskets will be enough. B-Nine, A-Rest and Bonzi have all been tested on Lobelia and are effective. In our experience, pinching is sufficient to create a well-shaped basket. If you decide to use PGRs, follow the label’s instructions. Aphids, whiteflies and thrips are the primary pests attracted to Lobelia. Trailing Midnight Blue are not prone to many diseases, but watch for botrytis while the days are short. This grey rot is usually associated with wet or humid conditions. You can prevent botrytis by allowing the plant to dry out between waterings, allowing for good airflow in your greenhouse, and spacing to allow the sun to penetrate to the soil level. The most common chemicals used to treat botrytis are Medallion and Banrot. Use them as a drench according to each label’s instructions. We recommend planting 5 starter plants per 10 inch basket. Use a well-drained soil in your baskets and plant your starter plants deep, allowing the ellepot to be completely covered by the soil. If you are planting 4” pots, 2-3 plants per pot should be sufficient. When using 3 starters, plant them in a triangle in the middle of your pot. Pinch Trailing Midnight Blue 5-10 days after transplanting to your final container. Additional pinches every couple of weeks may be required to shape your final pot.